World Environment Day promotes environmental awareness and sustainability across the globe – a United Nations initiative held annually on the 5th June. It has highlighted important global issues since its origins in 1974 – including climate change, marine pollution and wildlife crime. This year’s global theme focuses on the blight of air pollution. The Society has been championing World Environment Day for a number of years, and this year’s registration launch follows the huge success of last year’s event and awards, held at Arup, London. On the 2019 agenda is a series of insightful expert lectures on the chosen topic of “Net Gain” – a topical choice, complementing the connected global World Environment Day theme of “Air Pollution”. In his Spring Statement, The Chancellor of the Exchequer Philip Hammond announced mandatory Biodiversity Net Gain as a requirement for developments and the Government’s TwentyFive Year Environment Plan included a commitment to delivering a wider Environmental Net Gain. Among the speakers discussing this topic will be Nick Blyth CEnv, Policy and Engagement Lead at IEMA (Institute of Environmental Management and Assessment) and Claire Wansbury CEnv, Associate Director of Ecology at Atkins. 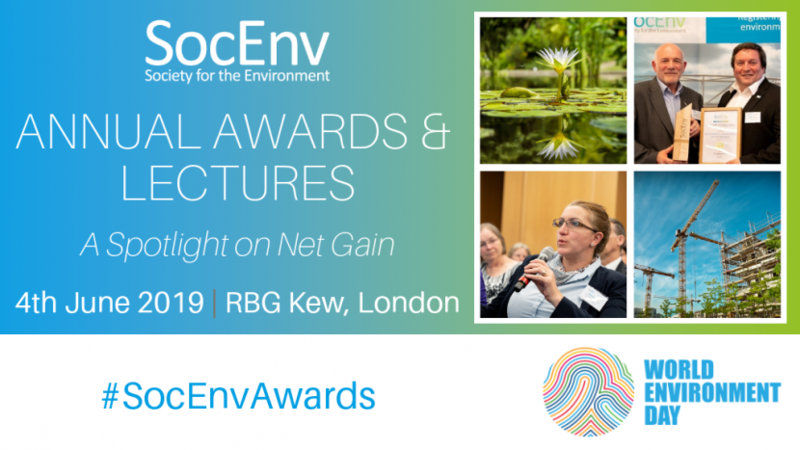 The event will also see Sir Graham Wynn HonFSE provide the annual HonFSE Lecture, and the presentation of the 2019 Environmental Professional of the Year Award – recognising the outstanding work of CEnv and REnvTech registrants. This prestigious award will contribute to an evening of celebrating and showcasing the achievements of those striving to protect and enhance the environment on a daily basis. Nominations will open in the coming days. “Whether you are nervous of the threat or excited by the challenges that face the environment there is no doubt that we live in interesting times, with consistent focus upon the agendas we hold dear as registered environmental professionals. The concept and process of Net Gain has gathered common parlance in policy and professional circles; perhaps for the first time there is an environmental term that makes sense to all and can be deployed by sectors with or without a deeprooted interest in the environment. The event is of particular significance this year as it marks a 15 year milestone for the Society. Everyone is encouraged to attend to celebrate the anniversary, World Environment Day and the work of environmental professionals. Registration is free for CEnv and REnvTech registrants and a minimal £25 early bird price is available to other interested parties until the 31st March. Register your attendance today at socenv.org.uk/event/WED2019 until 3 June.